Big Finish Folly, Part 94 – 100, by Jacqueline Rayner, Robert Shearman, Joseph Lidster, and Paul Cornell. 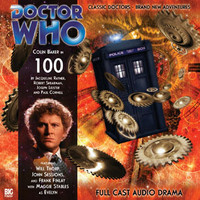 To celebrate release number 100 in the Big Finish Main Range, what better than a themed anthology in which Julius Caesar, Mozart, a jealous witch, and several incarnations of the Doctor himself all make appearances? What, indeed? This one really is a mixed bag of tall tales, with the Doctor and Evelyn forced to move at breakneck speed through the plots. Jac Rayner starts the ball rolling with 100 BC, in which the wisecracking Cannon & Ball of the time vortex inadvertently manage to prevent the birth of Julius Caesar – or so they think. The stage is set for high farce and jokes about the pungency of asparagus, with Evelyn also stubbornly resisting the Doctor’s attempts to put time back on the right track. It’s a slight but quite effective thing, a romp to match the colours of the Doctor’s coat. My Own Private Wolfgang is also top notch farce – but in this instance Robert Shearman gives the concept free rein. I can’t say much about the plot without spoiling it, but suffice to say that John Sessions, as Mozart, is quite clearly having a ball. Excellent stuff, with injokes aplenty as well as subtle pokes at the more possessive end of fandom, this is my pick of the set. Joseph Lidster’s Bedtime Story returns to more traditional Who concerns but still manages to leave a twist in the tale and subvert a couple of tropes while it’s at it. A slightly horrific retelling of Sleeping Beauty, with a jealous alien that was a wicked witch in the 18th Century standing in for the stepmother, it is better than it sounds – and in the process, I do believe it makes Evelyn the longest-running companion (listen & work it out…). Paul Cornell’s closer, 100 Days of the Doctor, actually winds up being a bit anti-climactic. Which it shouldn’t do, being that it’s Paul Cornell. But while the idea of the Doctor having to revisit past locations to work out where & when he was infected with a deadly virus is interesting enough, and it’s nearly a multi-Doctor tale by sleight of hand as a result, it just doesn’t feel quite strong enough. On the other hand, for much of its running time that sleight of hand keeps you from noticing that it is a two-hander with added Nick Briggs, and that’s pretty good. Summing up? Most of the anthology releases have a least one belter of a story to recommend them, and 100 is no different – My Own Private Wolfgang is proper first class. If Big Finish ever do a sort of Greatest Hits release, this story should be on there with Special Features and Circular Time: Autumn. But altogether, 100 is a decent set of stories that shows off the Doctor’s partnership with Evelyn to very good effect.